We cannot wait for the world to read Anna-Marie McLemore’s amazing second book, WHEN THE MOON WAS OURS. It’s been longlisted for the 2016 National Book Award for Young People’s Literature (SQUEE!!!) and has received three outstanding starred reviews. For the LGBTQ+ community, this year has been both groundbreaking and heartbreaking. I’m a queer Latina married to a transgender guy, and this year I’ve cried with joy for our best moments, and sobbed over our most devastating. I’ve researched what states the Transboy and I can travel to in case he’s not allowed to use public restrooms. And I’ve tried to smile and pretend I have no anxiety whatsoever about releasing WHEN THE MOON WAS OURS. But being a girl of color releasing my first queer book sometimes makes me afraid. And I want to do something with that fear. I want to use it to share love that exists within and for our community. Every weekday until release day, I’ll be sharing a different message of love for my LGBTQ+ community. Whether it’s yours too or you’re an ally, I hope you’ll join me. Have love to send the LGBTQ+ community? Share it on Twitter with the hashtag #allourlight. 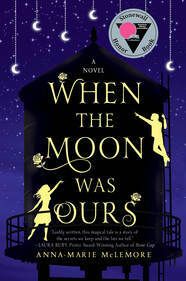 WHEN THE MOON WAS OURS will be available from Griffin Teen on October 4, 2016.